2007 "Simply Fancy" Tiny Kitty Collier outfit designed by Robert Tonner is spectacular on this 2003 basic Tiny Kitty redhead! 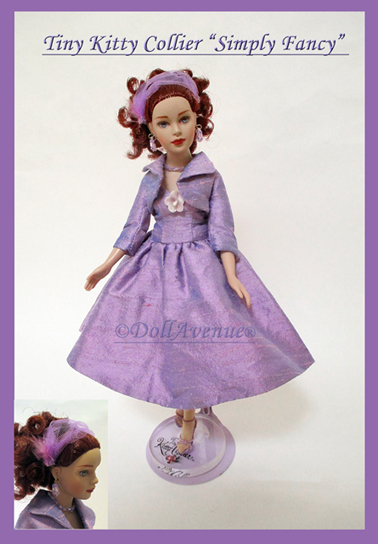 The outfit includes a Shantung purple strapless full-skirted dress, accented with a purple flower, matching bolero jacket and purple netted hat with feather. Under her dress is a white netted slip, hose and purple strappy heels. Accessories include purple and lavender bead earrings and necklace. *Note: The purple feather on her hat is broken and only a wispy remnant remains, though it doesn’t detract from the overall appearance. Price reflects the defect.